Funky Buddha has announced a bottle release of their barrel-aged version of ther Muy Bonita. 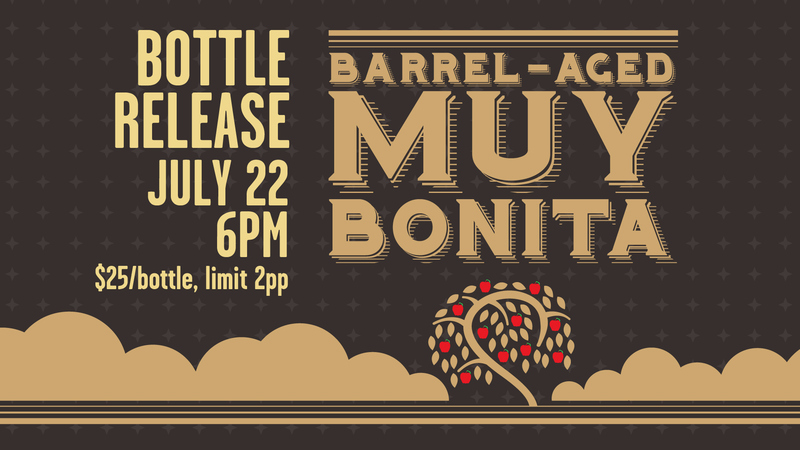 “We’re proud to announce our next bottle release will be Barrel-Aged Muy Bonita! Bottles of this limited run beer will be released on July 22 at 6pm. Barrel-Aged Muy Bonita is an Imperial version of our Bonita Applebum Apple Pie Brown Ale that’s been aged in Laird’s Apple Brandy barrels for three months. We use real cinnamon, vanilla, and apples to give it an insane apple pie flavor, while the barrel aging lends soft oak flavors and a pleasant liqueur-like finish. We’ll be releasing bottles of this special beer starting at 6pm for $25 per bottle. There will be a two bottle limit per person. After 9pm, any additional bottles remaining will be opened back up for sale. Bottle sales will take place in the Bocce Area. Please have your ID and payment ready to help the line move quickly. Cash or credit will be accepted. Mark it on your calendars, because it’s going to be delicious!